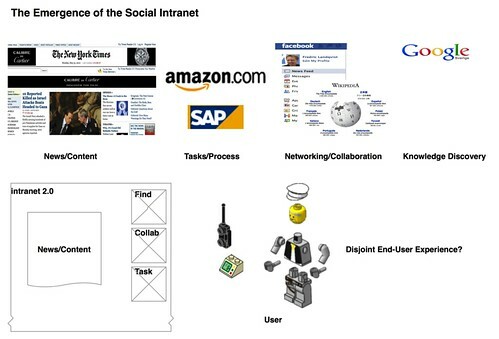 Social Intranet, originally uploaded by fredriclandqvist. Collaboration runs the show in any business, since we all are social creatures and even if mechanical devices helps us to become more networked it all boils down to our inherited path of social constructs. Internet have been the melting pot of new opportunities, and lately with masscollaboration and macrowikinomics we see emerging new practices in basically any domain. So why is still the Intranet such an difficult place to be in? Land of confussion! Well from my researchers perspective, having the intranet as platform perspective it is all pretty clear. We lack the open tinkering and innovation of the Internet. Command and control still runs the internal scene, not only from a techie perspective, but even more in terms of governance of the intranet (instead of networked/community based intranet governance?) and use patterns. Business models and ways of working do not change that easy! All Enterprise 2.0 gurus share the same stories about angst to change, and user adoption of the emerging social collaborative platforms, regardless of brand of choice. From the end-user perspective, we get disjoint end-user experience and clutter rather than slick, simple and seamless workspaces where we are able to contribute and share in the on-going conversations inside and outside the corporate walls. The traditional intranet that we all have used, do reflect top-down publishing metaphores and sometimes look like maze-like gigantic fileshares. Side by side to this creature we have also seen the growing use of collaborative (CSCW) platforms since the 90’s now reshaped in web collab workspaces, such as Sharepoint or the like. When the ambition is set to become the web desktop for any user, we also link to business applications that is supposed to support our daily work (tasks). Sadly the abundance of business apps really clutter the user-experience. Seamless is the last word the end-user use in my research. The remedy is then focused on knowledge discovery, or as the end-user puts it: I want to Google my internal work spaces, rendered as the intranet. Not an easy task, as we all know! Do these reflect your business challenges as well? The last decade most organisations have joined the enterprise portal journey. The casualties, and wounded from the trenches with intranet-professionals tells a bloody story for us to consider going forward. Failures in enterprise portal implementation and governance, is one of the pillars in knowledge management research in conjunction with (CSCW) collaboration backdrops! Is it possible to address the challenges above from an different angle? Through the cues in emerging Collective Action with Electronic Networks of Practice, and new ways of working for the communications guild with tight intersection to everyday work, so things do not get lost in transmission! What new intranet design implications decrease the portal-peril? While using Internet you use Google to locate things, but this space has become more social with referals (social objects). Google’s business model to deliver all information to all anywhere, will inside the corporation become a similar claim for the Intranet manager: ‘The intranet will be the access to all information and people, anywhere, everywhere using any device.’ Pretty bold, but as Mark Morrell Intranet Manager at BT tells his story, this overarching perspective makes his Governance model actually more crispy. The intranet with only one landing page, being a big search button? In the best of worlds, the internal information environment consisted of well hyper-linked resources, where content provision practice flourished with world-class information management and all things where open to anybody. Then this might apply! Sadly, most enterprises consists of closed silos, abundance of both structured data (hidden in information systems) and unstructured data ( all the rest!) Common sensical approach to information management and structure will obviously improve findability and emerging search patterns. This part of the cake, isn’t a redesign thing, it is a never ending story of refinement. With smart-mechanical-devices (info-flow and the meta-data gadget [1,2]) givin’ a helping hand in any content provision, to lower the threshold we will see improved intranet findability. For all of us trying to find relevant and timely content on the intranet to solve our daily issues and pains, we frequently use social networks to make-do. Connected to the corporate collective intelligence is key. This is why emerging technologies that fosters and cultivate networking and participation thrive, such as Yammer (microblogging). Cross-talk in large distributed work environments is difficult, and the ol’ school CSCW, Document Management and work-flow paradigm didn’t fullfill the ease of contribution. Several of the large scale implementations of i.e. Sharepoint2010 sites I have used for my research, have seen a exponential growth of Yammer use, contrasting the management pref. choice being Sharepoint 😉 simply because it is easy. The same goes with other more open collaborative platforms, such as wiki or blogs. Where trad. CMS contrasts simplicity in Confluence Wiki or WordPress. Interesting enough is that the better user adoption we get from collaborative platforms (open) the better findability we get! People want to have their intranet as easy to network within as Facebook, and simple to contribute in as Wikipedia, or in the blogosphere, and simple social enabled organisation as Delicious. Interoperability, the rope-trick to keep it dead simple, as with the use of rss. If we get the second wave of users in the collaborative environment to contribute according to our high information management standards and policies with good and helping tools. We get content chunks that will be able to mashup with simple means as web oriented architecture suggest. Contrasting more complex schemes as SOA! Simplicity works, and makes sense. When we use mashup technologies inside the intranet, social enabled collaboration and pragmatic information management we actually get ease-of-use as the business value from start. The intranet moves away from being indifferent (top-down) to become everyday work. Hence the emerging social intranet. Not one-stop-shop but a web of things, places and people connected as with Internet. Obviously intersected with SSO and proper Identity Management tools (back-end portal services). Push, pull and real-time into one vidid, and living intranet conversation! Externalisation and Mobility challenges. The conversations within the corporation on all levels will prosper in the emerging social intranet, but what happends with all the daily conversations that we all engage in outside the corporate walls? Social Media is all over the place, and many knowledge workers do have extreme mobile workspace environment (inluding myself). The collective intelligence and participation on the Net through either stationary or mobile devices is already in action. Sanity check reveals that many times the ordinary business users, prefer to set-up simple collaborative environments such as Google Apps / Docs with their professional networks outside the firm, instead of using the internal platform. Why you might ask, well simplicity and easy access to connect and intersect in inter-organisational conversations. 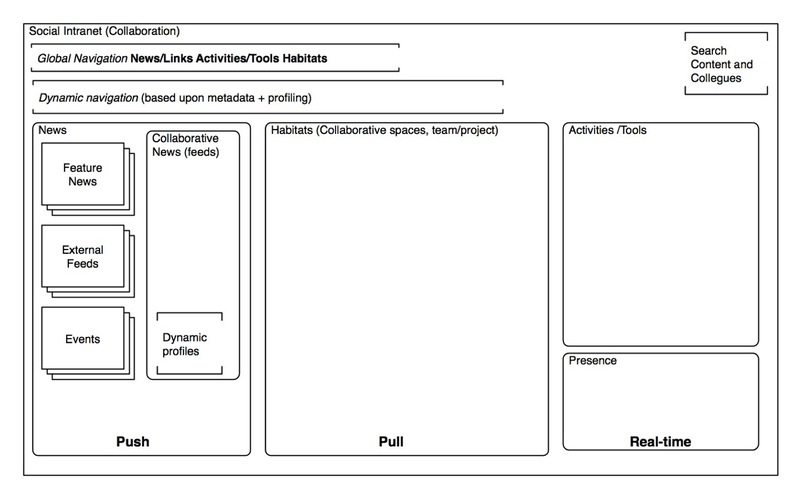 This challenge, will evolve into the open-intranet (which already some corporations use daily). At the fringe of the enterprise, we see new value networks emerge. Outstanding question, what will remain in closed silos inside the intranet? and how open and tranparent do the enterprise dare to become. Loosing control and behave according to the five principles for the age of networked intelligence (wikinomics and macrowikinomics) #1 collaboration #2 openness #3 sharing #4 integrity #5 interdependence. How do we cope with this more complex semi-internal information environment? This entry was posted on Monday, November 1st, 2010 at 11:11 am and is filed under emerging technologies, governance, social networks. You can follow any responses to this entry through the RSS 2.0 feed. You can leave a response, or trackback from your own site. Some really great points here. Very relevant for any intranet worker. A couple of reflections. As long as one adopts a single platform solution for intranet (such as the increasingly common SharePoint) then pretty much all of the above is moot since your options are both controlled and constrained by the platform and its designers. The big exception is governance, which an organization always has more control over, but even there the platform’s limitations still can set the agenda. The open solution, with internal content on best of breed external solutions is the way to go, but I think many organizations will need to fail one time more before coming to that insight. Change is hard! Well, as most corporation go into the Sharepoint snake-pit, I agree that we are still going to see casualties in the intranet-professional arena years to come. But if one targets the SP2010 with good ideas around governance, user adoption and IM practice. There are still options to survive the enterprise portal domain. I the enterprise chooses to integrate through ‘platform’, I think they should at least add some social and IM (search, taxonomy etc) gadget to make the journey a bit more pleasant. I am also following the Azure change, since things there might actually become ‘simpler’ that to run the show internally. But best of breed, and more open thinking into the intranet development would probably be the best cast. New and ‘smart’ enterprises I follow, simply skip the intranet backlash and just jump right into the open-cloudy-intranet collaboration space instead. I hope to contribuute & aid other users like its aided me. Very informative article! It was a good read but you could have used lesser words, but overall it is good. It is 2016 now and I am sure social intranet have evolved into something else better than when it was just starting and I agree with you that it should get a reboot! Here is another article (http://www.simpplr.com/blogs/2016/02/better-better-how-to-continuously-improve-your-intranet/) that goes along well with yours here! Take a peek!